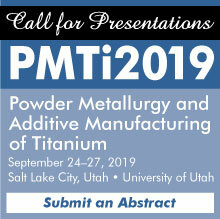 A powder metallurgy (PM) industry highlight, the annual Basic PM Short Course returns this summer to bring together those new to the PM industry and employees seeking to enhance their depth of PM knowledge and advance their careers. Held at Penn Stater Conference Center Hotel, State College, Pennsylvania, this intensive three-day course will run from August 12 through August 14, 2019. The 2019 edition of MPIF Standard 35–SLB, Materials Standards for PM Self-Lubricating Bearings has been released. This Standard is a must-have document and provides the design and materials engineer with the latest engineering property data and information available to specify materials for structural parts made using the PM process.